Style A bobbins are used with home and small commercial machines. Thinner thread sizes, like Tex 16 are normally used for embroidery. 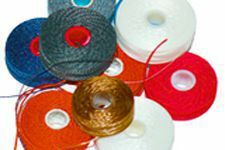 Nylon and polyester thread sizes 46 and 69 are normally used for heavier home sewing, and light to middleweight upholstery. Sizes 92 and higher normally require a commercial machine.